As the OPEC meeting rapidly approaches, bullish sentiment appears to have taken a time-out with the recent suggestion that the production cut extension may not be as certain as it once was. - The EIA sees the WTI discount of $6 per barrel relative to Brent persisting into the first quarter of 2018, which is $1/barrel more than the EIA predicted in its prior forecast. 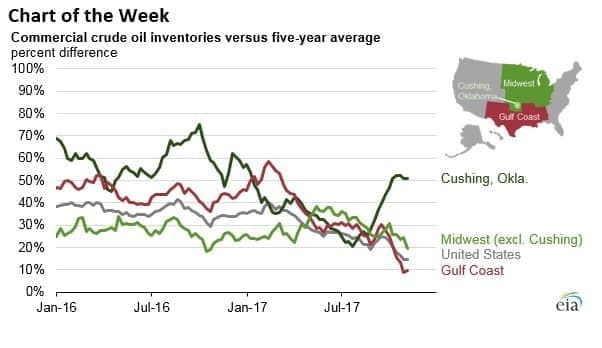 - Surging production from the Permian, plus a dearth of pipelines to accommodate all of that supply, has led to a spike in inventories at Cushing, Oklahoma, even as inventories have declined elsewhere. - These bottlenecks drag down WTI, and have contributed to the steeper discount relative to Brent. • ConocoPhillips (NYSE: COP) said that it would only invest in projects that can be profitable at an oil price below $50 per barrel. COP’s CEO said that most of the company’s new investment will be directed into U.S. shale. • BP (NYSE: BP) has agreed to sell three oil fields in the North Sea for nearly $400 million. At the same time, BP is expected to raise production in the North Sea to 200,000 boe/d by 2020. 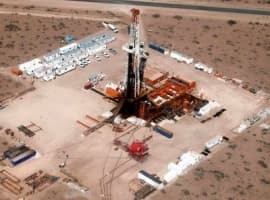 • Royal Dutch Shell (NYSE: RDS.A) and Suncor Energy (NYSE: SU) have said that synthetic crude production could temporarily dip because of problems at their plants. Venezuela expected to lose 250,000 bpd this year. Data from OPEC suggests Venezuela could continue to see its oil production erode, with losses expected at 250,000 bpd in 2017. The losses could accelerate next year, jumping to 300,000 bpd. Some think it could be even worse. An OPEC source told Reuters that Saudi Arabia would not increase production in order to compensate for falling Venezuelan output. Still, Reuters points out that rising heavy oil production from Iraq, Canada and Brazil are offsetting the losses. Volkswagen to spend $40 billion on EVs. Volkswagen said on Friday that it would spend upwards of $40 billion to expand its EV push, as well as build out its autonomous driving capabilities. The sum is much bigger than its previous plan. “With the planning round now approved, we are laying the foundation for making Volkswagen the world’s No. 1 player in electric mobility by 2025,” CEO Matthias Mueller told a press conference. 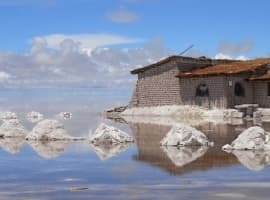 Meanwhile, BMW said it would switch to 100 percent renewable energy for its operations by 2020, up from 63 percent last year. Keystone XL approved…with caveats. Nebraska regulators gave the greenlight to the Keystone XL pipeline, removing one of the last barriers for the decade-old proposal. However, Nebraskan officials approved an alternative route, not TransCanada’s (NYSE: TRP) preferred route. That means that there could be new litigation that stands in the way of construction. Environmental groups argue that the alternative route has not yet been vetted. Oil majors push high-tech engine oil to rescue internal combustion engine. As some automakers shift aggressively towards electric vehicles, the oil majors are spending heavily to keep the internal combustion engine alive. The WSJ reports that ExxonMobil (NYSE: XOM), Royal Dutch Shell (NYSE: RDS.A) and BP (NYSE: BP) are seeking to develop the next generation of engine lubricants, which could help boost fuel efficiency, allowing gasoline-fueled vehicles to compete. U.S. gasoline demand spikes to record high. U.S. gasoline consumption hit a record high for the month of October, according to the American Petroleum Institute. Total deliveries of petroleum products hit 19.9 mb/d in October, 1.1 percent higher than a year ago. Gasoline demand averaged 9.3 mb/d. BNEF: $103 billion in spending on energy storage between 2016 and 2030. A new report from Bloomberg New Energy Finance (BNEF) finds that the global energy storage market will double six times by 2030, a similar trajectory that the solar market experienced between 2000 and 2015. Total spending will reach $103 billion over that timeframe. Hedge funds pare bullish bets ahead of OPEC meeting. Hedge funds and other money managers had built up a record level of bullish bets on crude futures, a buying spree that appears to have stalled as oil prices faltered. In the most recent week for data is available, money managers trimmed their net-length positions on Brent, a sing of a potential shift in investors sentiment. The buying looks overdone, and the danger is that anything other than strong resolve from OPEC to extend its cuts through next year could mean an unraveling of the speculative positions. 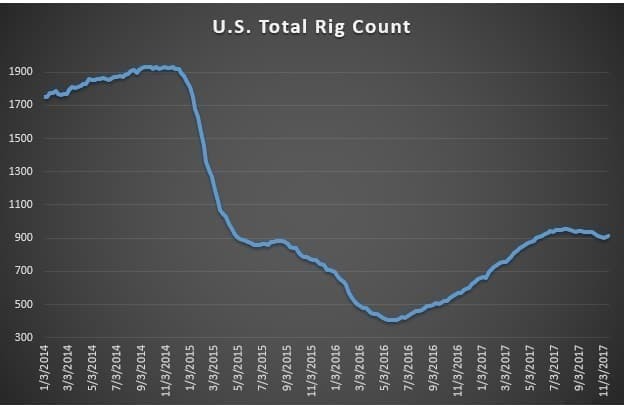 "We’re at levels where the market appears to have crested," Gene McGillian, a market research manager at Tradition Energy told Bloomberg. "Continuing to see supply draw-downs is probably what the next leg of the rally will be predicated on." 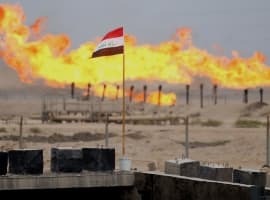 Volatile Iraqi oil production complicates OPEC efforts. Iraq has consistently flouted its agreed upon production limit this year, posting less-than-impressive compliance rates. 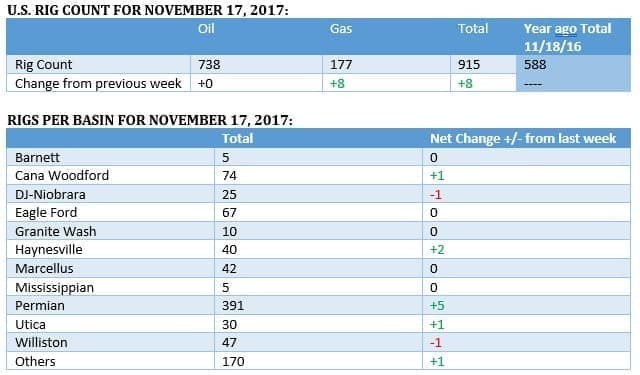 But production plunged by 120,000 bpd in October, pushing output below its production ceiling for the first time this year. The seesawing of output clouds the calculations for OPEC ahead of its meeting, particularly with volatile output in Nigeria and Libya. Still, Bloomberg notes that Iraq is intent on boosting output to 5 million barrels per day, well above its limit, if it can. Related: Is The LNG Glut Real? EV sales surge, led by China. Global electric car sales surged to a record high in the third quarter, with China driving much of the growth. EV sales hit 287,000 in the third quarter of 2017, up 63 percent from a year earlier and also up 23 percent from the second quarter. Bloomberg New Energy Finance predicts that global EV sales will top 1 million for the first time this year. Rosneft to supply Chinese partner with oil, strengthening ties. Russia’s state-run oil company Rosneft has agreed to supply China’s CEFC with 244,000 bpd for the next five years, strengthening ties between Moscow and Beijing. CEFC is also in the process of acquiring a 14.16 percent stake in Rosneft, a deal worth about $9.1 billion. The relationship is mutually beneficial – Russia needs to sell energy to China and China needs access to energy to fuel its economy. Natural gas glut could crimp Permian production. Permian shale drillers are running out of places to put all of the natural gas coming out of their wells. Gas is produced as a byproduct of oil drilling, but the pipeline network in Texas is full, reports the WSJ. Natural gas spot prices have cratered, which is a boon for utilities in the region that burn gas for electricity. But it could force shale drillers to cap their wells, which could put a dent in oil production.